And back with another Orctober entry! Two orcs in one month is pretty unheard of for me. But his orc arrived unexpectedly and I felt that it must be a sign from Gork or Mork that I must paint him for Orctober. A big thanks to Erny of Erny's Place for the Banner! 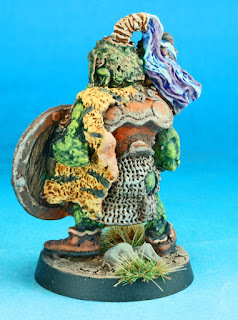 Here's a fourth orc for my chaos warband. Before I go any further, I want to thank Matthew Sullivan at Oldenhammer in Toronto. 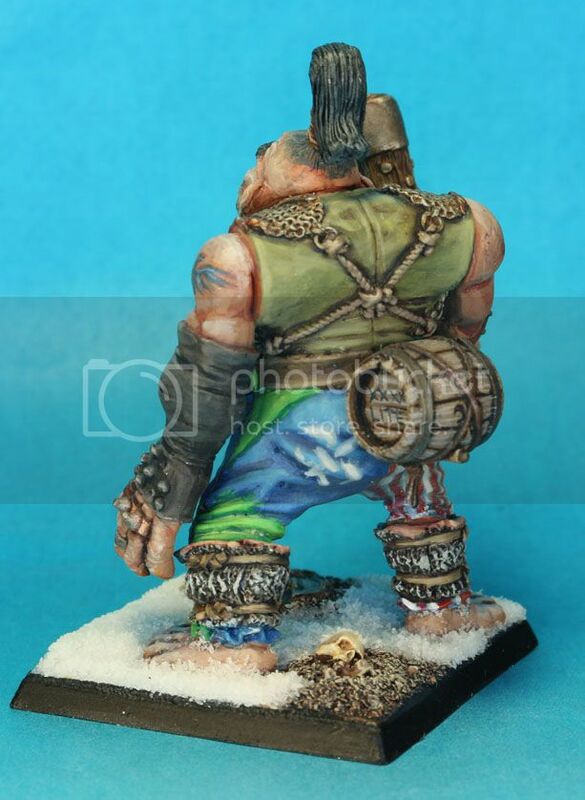 I'm pretty sure his Bob Olley black orcs are about the only painted examples that exist of these models. Without his pictures, I'd never have figured out what half of the stuff on this model, or the other three I painted, were. 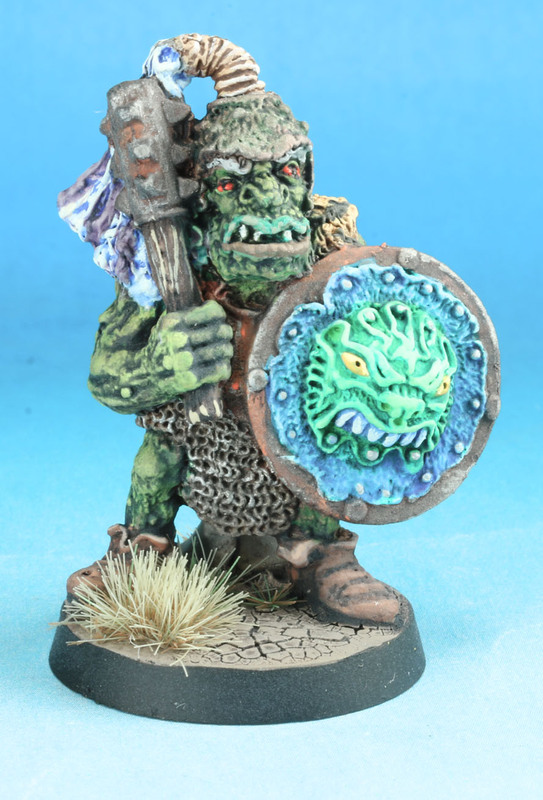 So, what is there to say about a Bob Olley Giant Black Orc? 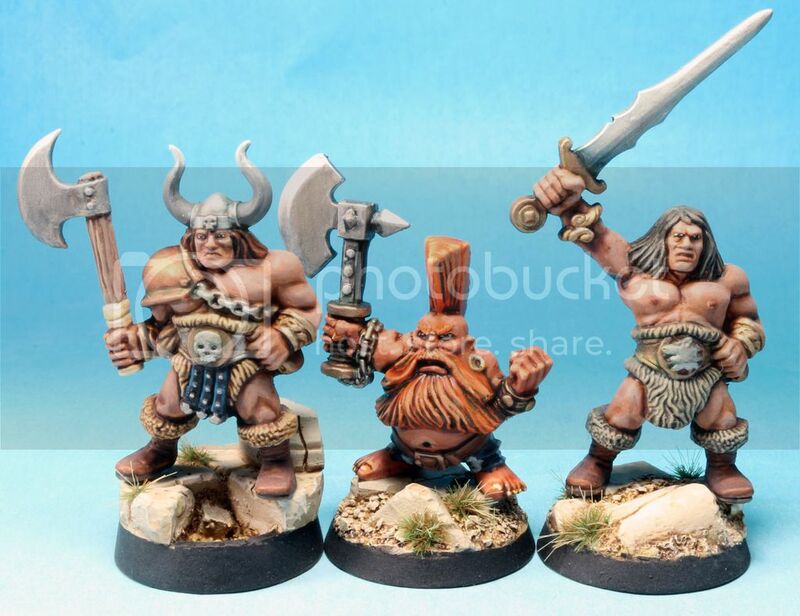 These things are hideous to look at and they are covered with so much texture that I am pretty sure there is no way to paint them without the models looking dry brushed. And yet...they are stupendous models. For this orc, I started with a base of Warboss Green (Goblin Green) and Flash Gitz Yellow (Sunburst Yellow) and just kept applying thin washes of progressively darker green and eventually black inks. 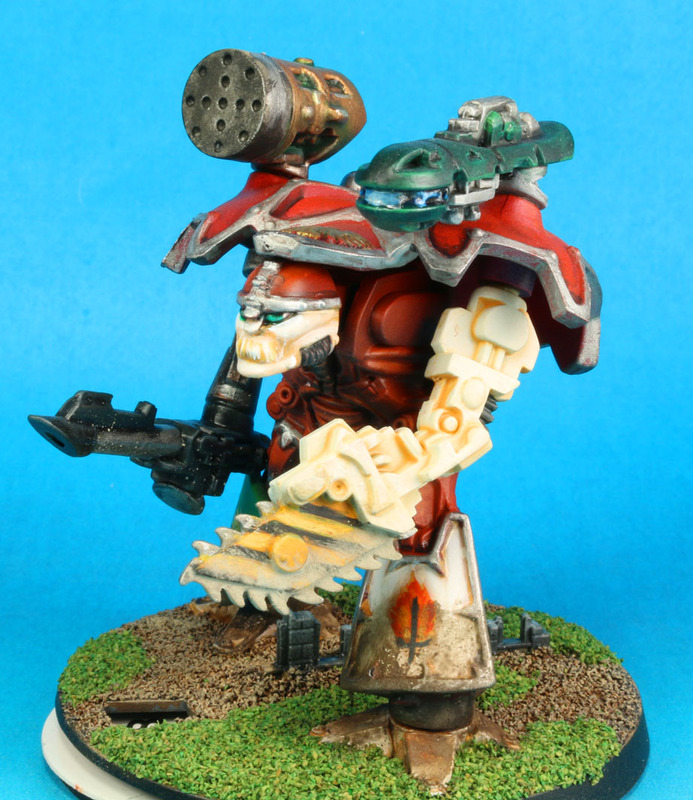 The metals were done with buffable paints and pigments. I followed a tutorial in the Metal issue of Mig Jimenez's Weathering Magazine. 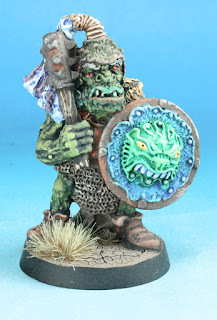 I used the same methods on my previous black orcs in my chaos warband. In the end, he was another fun model to paint. Ah, it's autumn, and with that time of year comes all the things we love: pumpkins, pies, pumpkin pies, and Orctober! It's an annual tradition that I've never actually taken part in. But this year I have remedied that. I should begin with the fact that I've never been a huge Orc/Ork fan. But I do have a goal of painting enough Orks to be able to run Battle of the Farm from the Rogue Trader book, so I figured I might as well start with one Ork this year. 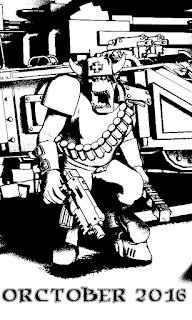 One of the few Orks I have always loved is the Bad Moon boss, but I didn't paint him (got your hopes up, didn't I?). Instead, I chose a regular Boy, but I did paint him with some Bad Moons colors. 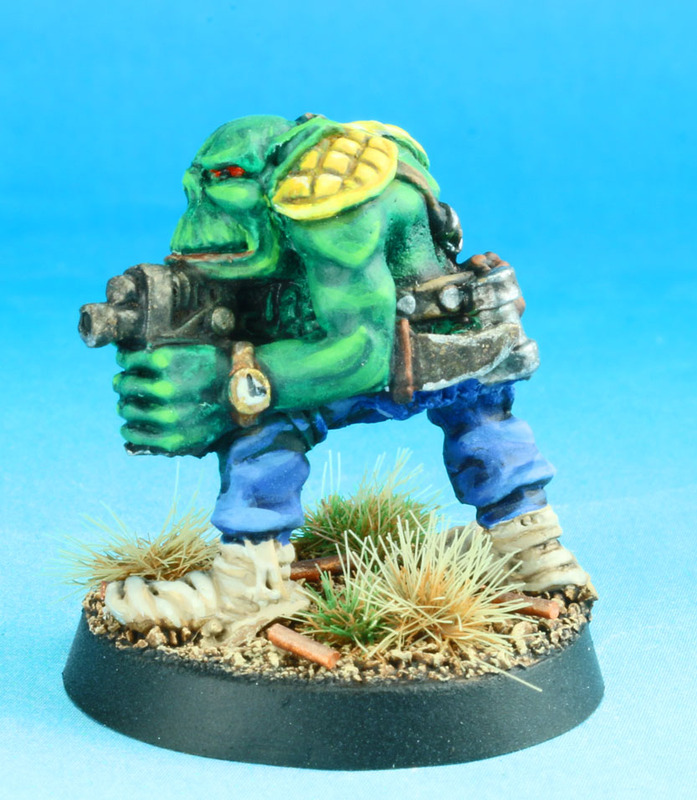 I figure I once I do paint the Bad Moon Boss, the regular Ork boyz will be his retinue scouring the planet of Rynn's World. This model was hellafun to paint. 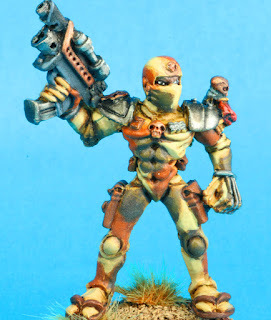 The flesh was done with the slightly modified recipe from an old GW painting guide. I started with a mix of Caliban Green (Dark Angels Green) and Warboss Green (Goblin Green), followed by a slightly thinned wash of the old hex pot Orc Flesh Wash. After that, I reapplied the base coat and then added bits of Flash Gitz Yellow (Sunburst Yellow) until I was happy with it. For the Yellow, I painted the padding bleached bone and painted the cracks with Devlan Mud mixed with Vallejo Thinner. Then I highlighted with pure white and applied a coat of Lamenter Yellow glaze. I repeated the last step a second time to add to the intensity. A full explanation of this can be found here. One final note, I have no idea what that was supposed to be on his left wrist, but once I saw it, I couldn't paint it as anything other than a wrist watch. The idea of an Ork with a wrist watch was so absurd, I couldn't control myself. I blame the same part of me that forces me to tell "dad jokes." I'm internet famous! 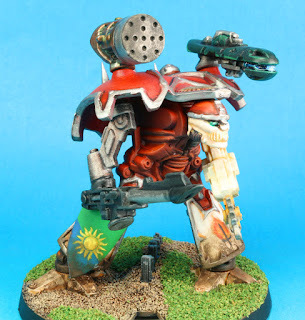 I recently recorded a podcast with Jay Arnold of the Veteran Wargamer. In it, we discuss all things Oldhammer, especially about how I created it and how nice it is to own Oldhammer. What? Oh, sorry, my delusions took over! It's a great podcast, go check it out here. I wanted to make sure to throw out the link to the blog referenced in our in discussion on the Pathetic Aesthetic, which can be found here. One of my long term projects is to complete the models that go with many of my older GW board games so that I can play them with my children when they're old enough (and they're getting close!) and quite possibly, their friends. 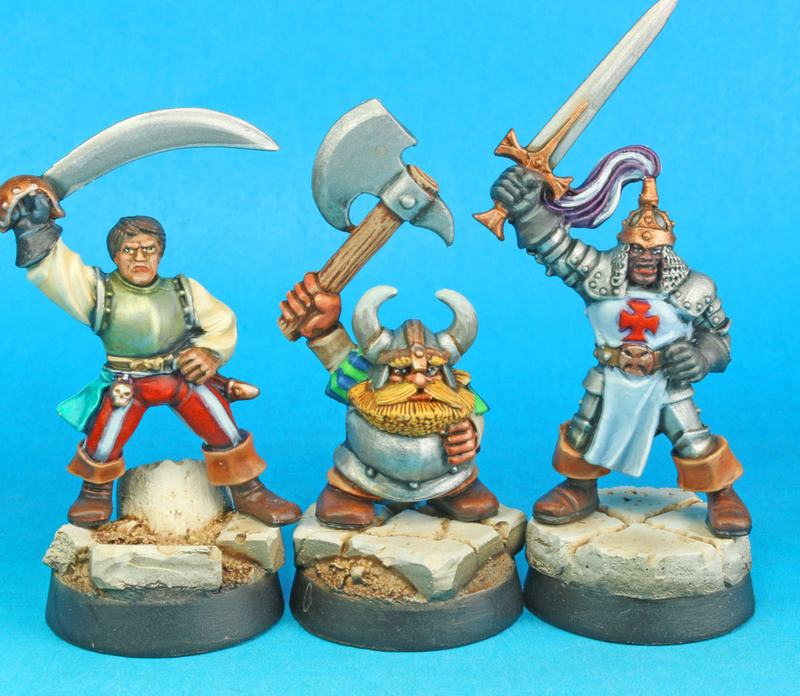 For this batch, I painted the Swashbuckler, the Dwarf, and the Knight. For the Swashbuckler and the Knight I wanted to do something important for teaching my children. Minorities are very underrepresented in Science Fiction and Fantasy, which I find odd because many of us were outcasts ourselves and we should fully understand the value of inclusion. The Swashbuckler was painted with Latino skin tones while the Knight was painted with African skin tones. I chose these two models for this treatment for two reasons. First, and most importantly, these character classes have very little baggage associated with them. Swashbucklers are known as heroic fighters with defeat their enemies with style, while Knights are generally viewed as virtuous warriors upholding the honorable code of chivalry. I did not want to create any negative implications with the chosen models. Second, many of the Talisman models are modeled with Anglo features, which would make it difficult to paint them in a manner that would fit the traditional racial features I wanted to portray in a realistic manner. So one of my favorite games of all time is Epic. I've played most of the editions, starting armies as the game gets popular the selling my army when everyone local quits playing. The last time that happened, I decided to buy up a second army (I now have a third too!). But this post isn't about my second or third armies, it's about my primary army, the Dark Angels. As I work my way through a second company of Dark Angels, I've now completed a Devastator detachments. Nothing special here, some green space marines and their rhinos. But now for what you really want see, Titans! 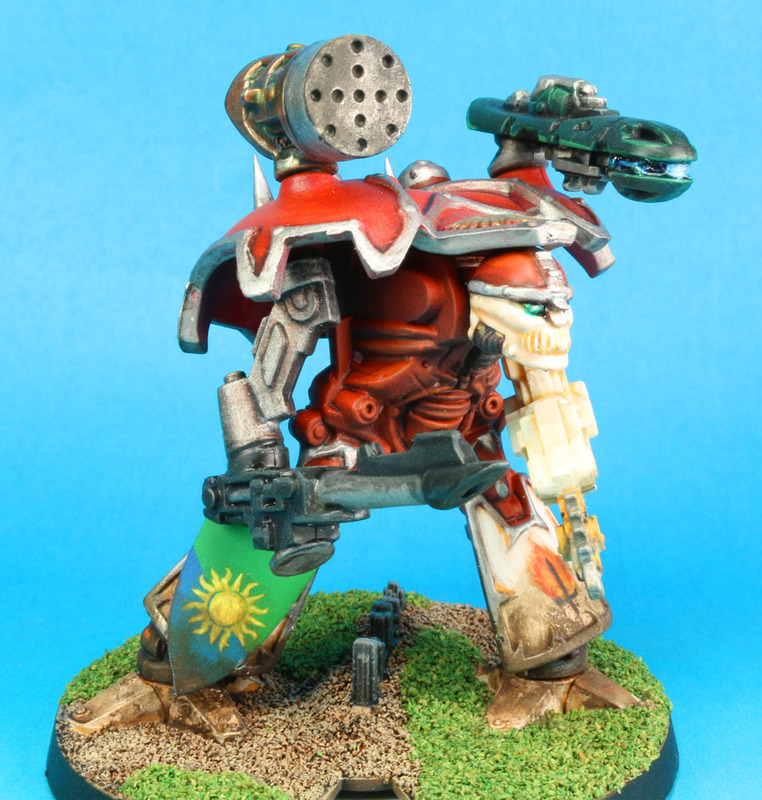 I chose to paint half of my titans as Legio Atarus, a storied legion present at the drop site massacre of Isstvan V. This way, they can do double duty on a project several of us are working on to play the massacre at next year's (hopefully) Oldhammer day. Plus the red and cream color scheme looks great and the legion symbol is pretty easy to paint! I ended up adding shields on both of them to cover some imperfections. One was missing a chunk of trim on the backpiece while the other had a gouge running up the middle of the shin plate. I think the heraldry came out pretty well. Imperial assassins. The shadows that haunt the traitor. Bane of the heretic. Those who truly face the wrath of the Imperium risk facing the execution in the form of the assassin. 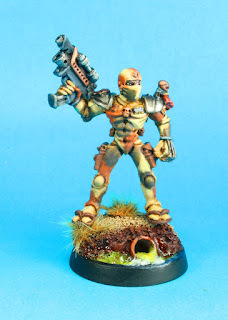 In the early days of Rogue Trader, the background of assassins had not been fleshed out; they were kind of a mix of the three most famous temples mentioned in 2nd edition but most closely resembled the modern Callidus assassin. They even got polymorphine! I picked this up at the US Oldhammer Day in 2015 and finally (finally? It was less than a year! 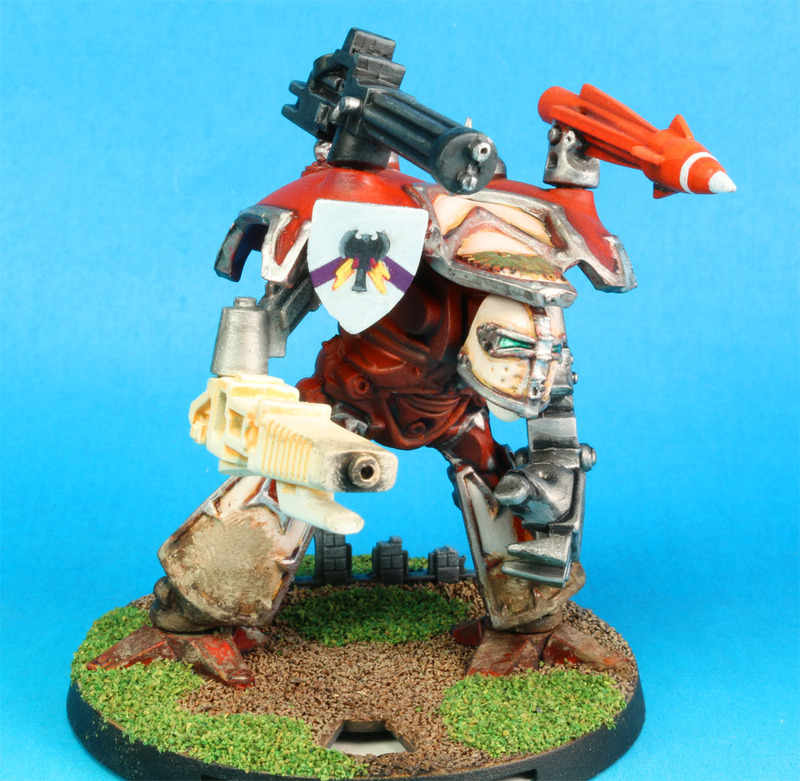 I wish all my models got painted that fast) got around to painting him. I wanted to do something different with him though. Every painted example of this classic model was largely a single color and almost all were dark: black, blue, or green mostly. I had seen one in a solid yellow body suit. 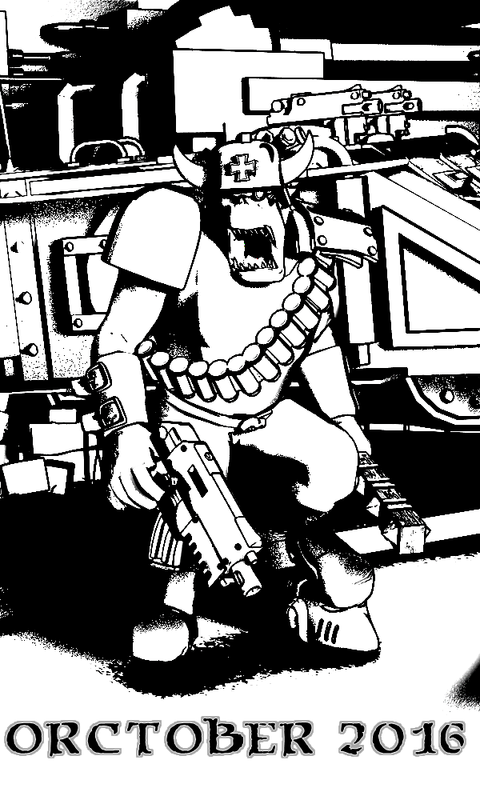 I decided that I wanted mine to to look as if he was on the hunt for some heretic in a wasteland, but not necessarily through impersonation, plus I wanted to try something desaturated like Asslessman over at Lead Plague does so well. I opted for a desert camo scheme. I also wanted to try some water effects I'd recently picked up so I placed him on top of a broken sewage pipe flooding a drainage ditch of some sort. Overall, I'm pretty happy with him. 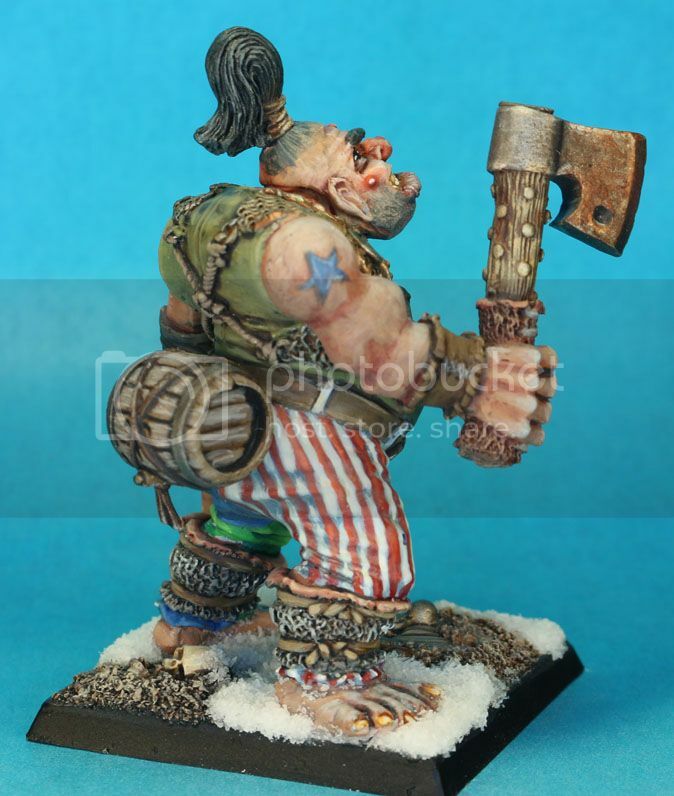 He didn't turn out exactly how I envisioned, but he looked good enough to place first in the Single Figure category at the USA Oldhammer Day, last weekend! 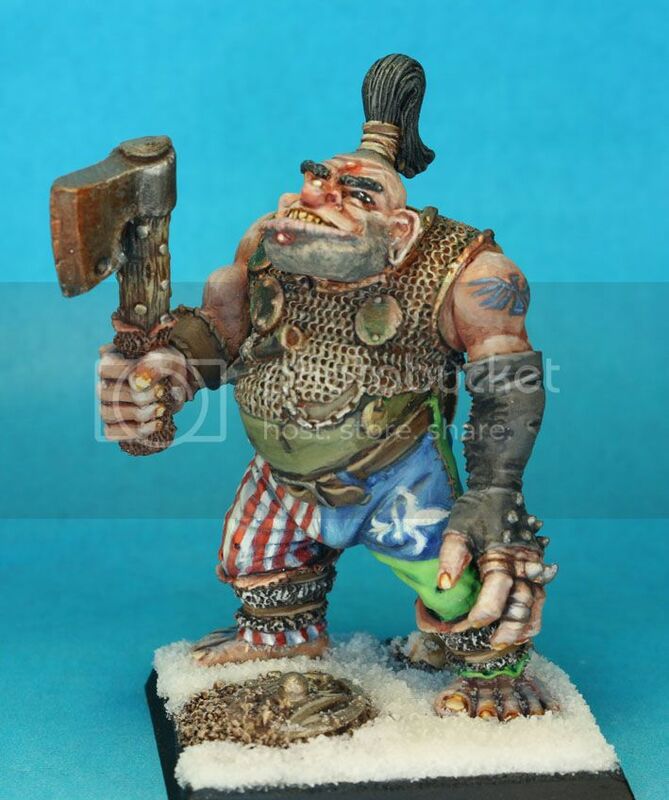 This past weekend we held the third Oldhammer Day here in the USA. About twenty of us Oldhammerers descended upon Ashburn, Virginia at Huzzah Hobbies for two days of gaming. It was a hell of a time. And they weren't all local. We had attendees from Arizona, Maine, and Ohio. A big thanks to Huzzah for allowing us to use their space! Unfortunately, I took no pictures because the camera on my phone is, to put it politely, not good. 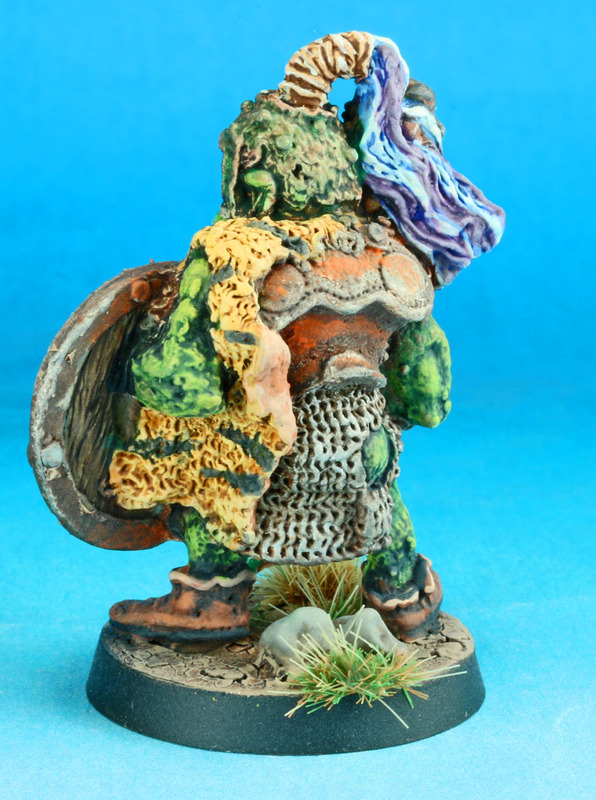 However, many have been posted on the Oldhammer in the New World Facebook page and many more will be posted shortly on Sean's Wargames Corner, Give'em Lead, and Blue's Marauding Miniatures. Probably other places too. I wanted to give a big shout out to everyone who came, and especially everyone who ran games: Brian, Lissanne, Dustin, Ben, and especially James--who ran three different events! We also couldn't have done it without Sean and Richard who helped with a ton of the administrative tasks. And I can't forget Fimm McCool at Oakbound Games and Ramshackle Curtis at Ramshackle Games for providing us with limited edition event minis! I had a blast playing in James' huge Space Hulk game. We had 5 squads of terminators and we almost pulled off the victory! James runs an amazing game. I also busted out the Gunners in a game of Bloodbowl against Lissanne's Chaos Dwarfs. No points were scored in an absolute slug fest between a pair of arch-rivals. 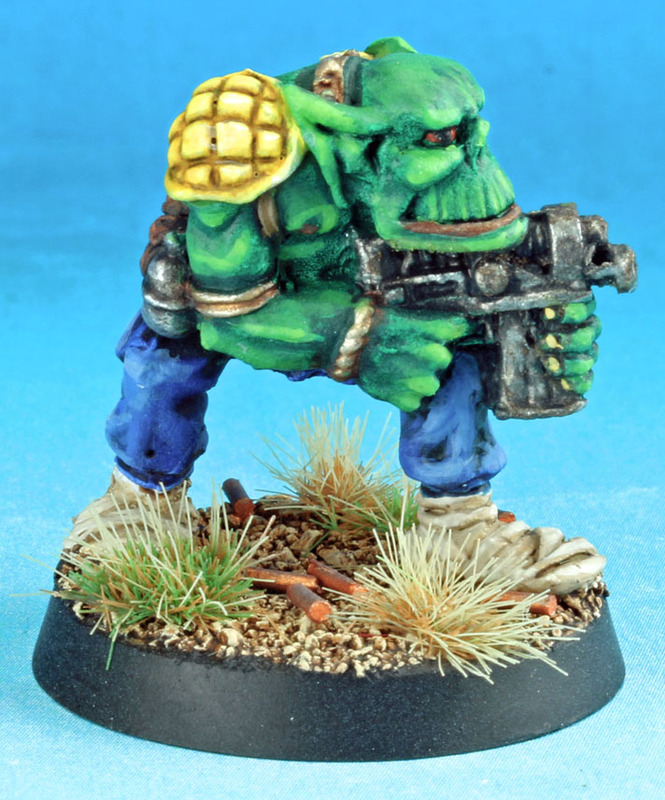 Finally, I took a squad of marines into Nu Ork for Dustin's scenario. It was all great fun.